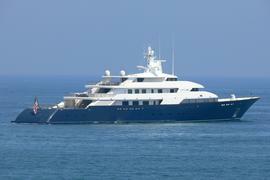 It is easy to say that a certain yacht is ‘influential’ but in the case of Carinthia VI you can actually see it. Leslie Wexner, head of Limited Brands, which includes Victoria’s Secret lingerie, so admired Carinthia VI that he asked Jon Bannenberg to design him a yacht that was essentially similar in appearance but much larger and more modern, and this was the starting point for Limitless, launched by Lürssen in 1997. Carinthia VI had been based on a Lürssen patrol boat hull but for Limitless the shipyard and designer were able to start with a clean sheet and came up with a motor yacht of 96.25 metres. She was one of the largest around at the time, leaving aside Arab state yachts and the immense Lady Moura, and was, in fact, the largest American private yacht when launched. In spite of this, the lines of Limitless clearly mimic those of Carinthia VI, especially the curved front to the superstructure, made from a grid of small windows, and the way the forward lean of the transom matches that of the stem. Another point of similarity lies in the fact that Bannenberg did not want to spoil the lines of the bow with a forward mast, though in this case the solution was to use a retractable carbon fibre mast. For some reason Wexner did not select Bannenberg as interior designer – perhaps he found his modernism less than relaxing – instead using the well-known French interior designer François Catroux, whose repertoire included a small number of yachts. In any case, Wexner has never permitted any photographs of the interior to be published, so its style remains conjectural. 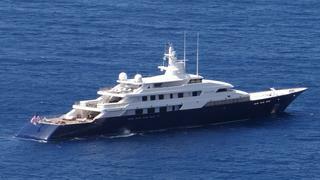 Wexner wanted his yacht to be as fast as Carinthia VI – a demanding requirement for such a large vessel. This led to a unique diesel electric propulsion system being developed for Limitless, designed to allow her to make a transatlantic passage at 25 knots non-stop and a transpacific passage at 20 knots non-stop. One of her transatlantic trips from Nice, France to New York, USA was made in 7 days, including a stop in Newport, Rhode Island to clear customs. Limitless has two 3412 Caterpillar generators for ship service, one of which can run the entire electrical supply for the vessel. If needed, the second 3412 generator can operate one of the two bow-thrusters and the fully rotatable stern-thrusters to propel her up to 5 knots without turning the main propellers or running the propulsion engines. Once out of the harbour, the press of one button would start one of the 3516 Caterpillar propulsion generators, propelling her up to about 11 knots (depending on fuel load). If the throttles exceeded that speed, the second 3516 generator would automatically start, increasing the speed to 15-17 knots, depending on the load. If additional speed was required, the ‘Diesel Mode’ button is deployed to start the diesels, warm them up, and automatically transfer the propulsion from the electric to the diesel engines, which would take the vessel up to 23 knots. A third button, ‘Boost Mode’, would start the electric propulsion and add that power to the gear-box via electric motors for a maximum speed, of 25 knots. Acceptance sea-trials recorded 26.4 knots but with a light fuel load Limitless once actually hit 27.5 knots. The propulsion system was originally designed for Controllable Pitch Propellers, but these were removed from the specification by the builder when new calculations indicated the boat would be 10% over its original calculation. The owner later added the Controllable Pitch Propellers and modifications were made to the diesel electric system that reduced the output, and thereby Limitless‘s top speed: she is now unable to exceed 23 knots. The yacht’s design made it possible to swap out the propulsion generators through the tender bays by using the yacht’s own tender cranes, and this facility was actually used when a generator failed early in the yacht’s life. It is fascinating that although Limitless is clearly inspired by Carinthia VI, the yachts are quite different in proportions: Carinthia with her long slim lines and narrow beam against the much larger and beamier Limitless, which looks equally good and arguably more elegant. The relationship between the two yachts is striking and extends down to having an identical dark blue colour scheme on the topsides and white superstructure.